Yes, after 9 weeks and four days, my brother has landed. And you know what that means? 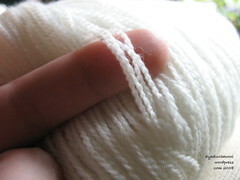 One 440 yd skein of Gossamer in the on-sale colour “Trail”. I got: Harmony wood double pointed needles in 2.5 mm and 2.25 mm (for sock knitting – not pictured ’cause I’m an idiot and I forgot), 1 skein of Lace-weight “Bare” merino yarn (to be dyed, or not, haven’t decided) and 1 skein of Gossamer in the on-sale colour of “Trail” (for either the Mountain Stream scarf or Wild Strawberries scarf). This was what I bought myself, but the good-egg that he his, by lil’ bro’ brought me back some tourist tat! 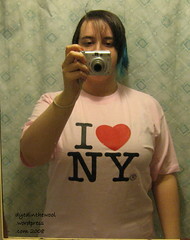 My brother went to New York and all I got was this tourist-y t-shirt! Guess where he went! Go on, guess.